Located some seventy-five miles out into the Atlantic Ocean on the outer arm of Cape Cod, the Town of Wellfleet offers an abundance of quaint rural seaside character and charm and spectacular natural resources. Bounded on the east by the Atlantic Ocean and the west by Cape Cod Bay, 61% of the land area of Wellfleet is in the Cape Cod National Seashore Park. Wellfleet has a total upland area of approximately 13,100 acres (20.47 square miles). Of this total, about 8,000 acres (12.5 square miles) are within the Seashore boundaries, leaving 5,100 acres (8 square miles) outside. During the summer, the population swells from 3,500 year-round residents to an estimated 17,000 persons enjoying the Town’s miles of ocean and bay-side beaches; numerous beautiful, clear, spring-fed, ponds; many fine art galleries, shops and restaurants; and the magnificent Wellfleet Harbor offering a constantly changing panorama of sail boats, motor yachts, sport fishing boats and trawlers. An extremely diverse community with an intriguing history of an extraordinary nautical atmosphere, the friendly charm of the Central Village provides the pedestrian with a vast array of browsing, dining, picture-taking and sightseeing opportunities within a relatively short walk. The Central Village is also the focus of Wellfleet’s year-round civic life and commercial activity. The town is home of the Cape Cod National Seashore Headquarters as well as the 1,000 acre Massachusetts Audubon Society Wildlife Sanctuary. Some of Cape Cod’s finest ocean surfcasting, fresh water pond and Cape Cod Bay boat fishing possibilities are found in Wellfleet, and the town is well known for its plentiful supply of shellfish, including the famous “Wellfleet Oysters”. The area now within the limits of Wellfleet was originally part of the grant by the Court of New Plymouth to “those that goe to dwell at Nossett” (Eastham) made in 1644 and later extended in 1654 and 1674 to include virtually all of the Outer Cape. Sometime before 1644, the colonists of Plymouth and Duxbury apparently discovered rich fishing grounds in what is now Wellfleet Harbor, and began to refer to the entire area surround these waters as Billingsgate, after the famous London fish market. The first permanent settlement in this area was made in the 1650’s and the number of dispersed dwellings slowly increased. By the second decade of the eighteenth century, the inhabitants of the “hamlet of Billingsgate” began to think of establishing themselves as a separate town. A petition for incorporation was denied in 1723, but in that same year, the area between Hatches Creek and the Truro line was established as the North Precinct of Eastham. 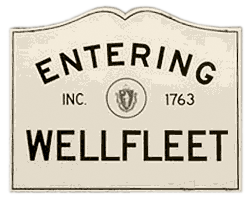 In 1763, the General Court established the North Precinct as a separate district to be known as Wellfleet. Although there is no Wellfleet in England, the leaders of the new community had hopes that the sales of local shellfish might profit by association or confusion with the then famous Wellfleet oysters produced in the eastern waters of England. In the 1650’s, the first settlers began to clear the land for subsistence farming and mowing salt hay on the meadows surrounding the harbor. However, the outer Cape could support only a small population by agriculture alone and the narrow strip of forest between the bay and the backshore could not supply the necessary firewood and lumber for construction and shipbuilding. The sandy soil, when stripped of vegetation, was eroded by the wind into sterile dunes; this was realized in the eighteenth century when excessive deforestation was followed by overgrazing. Some agriculture continued, however, with modest production of rye, corn, livestock, asparagus and cranberries, but in declining amounts. Even before the first settlers arrived, Wellfleet Harbor was known for it abundance of fish and oysters, and by 1707, whaling had become a thriving industry with a fleet of ships which cruised as far as the coast of Africa. This brought great wealth to the Town. All of this prosperity was brought to a sudden halt during the Revolution when the British blockade condemned ships of the fleet to rot at their moorings. After the war, lack of capital to replace the great whaling fleet ended Wellfleet’s glory as a whaling port. However, fishing began to flourish and by the nineteenth century Wellfleet became one of the leading fishing ports in Massachusetts. At the same time the local shell fishermen were shipping in oysters from Buzzards Bay, Connecticut and the Chesapeake, planting them in the harbor to pick up the famous Wellfleet flavor and re-harvesting them for the Boston market. The mackerel fishery began to decline around 1880, and by 1900 not a single schooner was sailing from Wellfleet Harbor. The shellfish industry remained active, however, and although it was no longer profitable to transplant oysters in large quantities, the production of native oysters gradually increased. The harvests of oyster, quahogs, soft-shelled clams, bay scallops and sea clams have fluctuated widely from year to year but on the average have remained an important part of the Town’s economy. Although a certain number of people from the Boston area had summer homes in Wellfleet in the nineteenth century, the first significant development of the tourist industry began after the turn of the century when L.D. Baker constructed the Chequesset Inn on the pilings of the abandoned Mercantile Wharf. The decline in prosperity and population that had begun in the last quarter of the nineteenth century was reversed. However, this growth was slowed by the depression and was modest until after World War II and the construction of the Mid-Cape Highway. 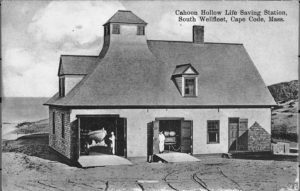 An event that has had a dramatic impact on the preservation of Wellfleet’s character in the face of burgeoning growth elsewhere on Cape Cod was the establishment in 1961 of the Cape Cod National Seashore. The Seashore’s designated boundary includes about 8,000 acres in the Town of Wellfleet, representing 61 percent of the Town’s 13,100 acre total area. Large areas of important Wellfleet ecosystems like the kettle ponds and Herring River basin, are at least partially under the land management policies and guidelines of the National Park Service, and therefore benefit from the resource protection objectives of the National Seashore.